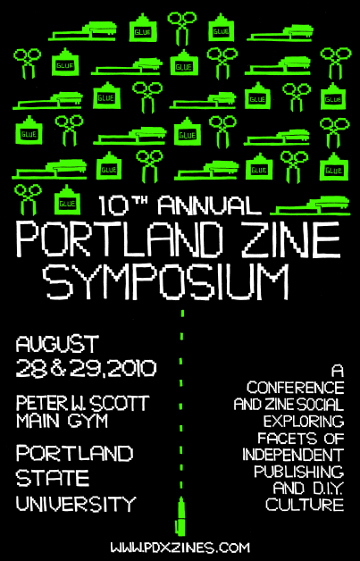 tabling registration is open for the 2010 Portland Zine symposium! We’ve got a couple major announcements for you! First, are winning artwork for PZS 2010 has been chosen! Our winning artist is Lisa Rosalie Eisenberg and you can view the poster here, but if you check Portland Zine Symposium website, you’ll see her fabulous work has been applied to our website’s design! Thanks to all who submitted artwork for the 2010 poster art call, it was a challenging design to pick the work to represent the convention this year. We would also like to announce that a close second was artwork from Brian Kaas, so we plan on making a special edition button from his submission, to be available at PZS, as well as printing his poster art on the back of the program. Now here’s the news you’ve been waiting for! will open up at 4pm (PST) today, April 6th. When you register, be on the lookout for a special question in your form, “Would you like to preorder a Special Edition, 10th Anniversary Program?” It adds just $1 to your donation total and ensures you will get the guaranteed-to-be-popular, zine style program we’re cooking up to help commemorate our 1th anniversary! Also, remember that we’re moving from the Smith Ballroom to PSU’s Main Gym this year. This means more space and more tables! It also means that PZS has to pay a ton more money to book the space. You can support us a variety of ways, but this year we’ve adding some special gifts for supporters able to contribute donations. You can check out the donation levels here and you can donate just by clicking here! As always, we love help at the event, too. Volunteers at the event get cool things like t-shirts and our undying gratitude. 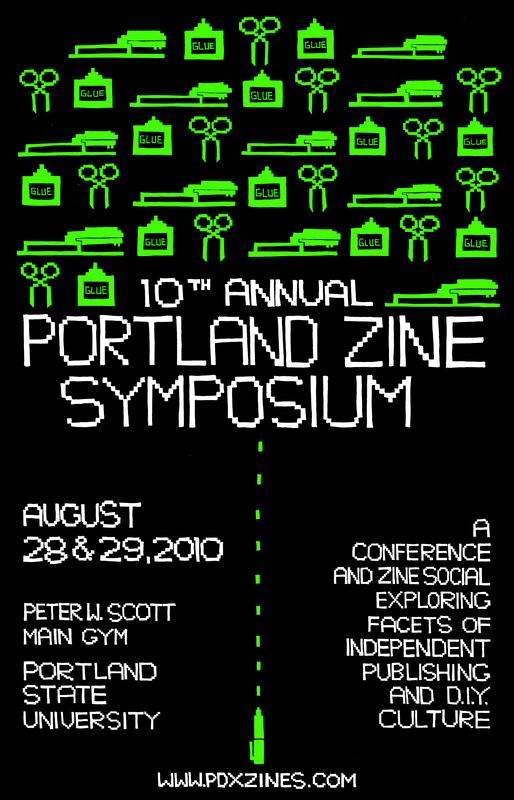 1) Submissions for Artwork for the 2010 Portland Zine Symposium are due today! Go here for more info. 2) I will be reading with a host of portland zinesters and small press authors at Powell’s Books in Downtown Portland today as part of Smallpressapalooza! The event starts at 5 but I won’t be reading until 9pm. Go here to see who all will be performing. 3) I’ll be performing so late tonight because my friend Caleb is coming in to town and I’m going to go meet him at the airport! Caleb is one of the lovely people I met while I was in Halifax at the Anchor Archive Zine Residency I’m really excited to show him my city! We plan to take trips to the coast, and to the Riverhouse plus all sorts of bicycle adventures in Portland. The past week has been filled with large button orders, laser printer woes that has me chatting with tech support for hours, a sick animal in the family, cleaning house, small cuts and minor injuries to my hands and fingers, practicing for the reading at Powell’s, and Paul and I celebrating our 13th, 6th, and 4th anniversaries. So, I have been an organizer for the Portland Zine Symposium on and off for the past 10 years… that makes me feel old. Even if we don’t have a time and date year (probably late August but don’t cross your fingers) we are putting out a call for art work! PZS is looking for art submissions for the 2010 poster. This year’s theme is “Zine Arcade” Your art submission should be your creative interpretation of that theme. Submission deadline is March 15th. Submissions can be emailed to pdxzines@gmail.com (most strongly preferred), mailed (to PO Box 5901 Portland, OR 97228-5901), or dropped off at the IPRC.